. 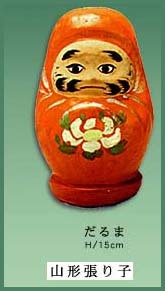 Yamagata Folk Art - 山形県 - Mingei .
. ... nemari tora ねまり寅　crouching tiger . 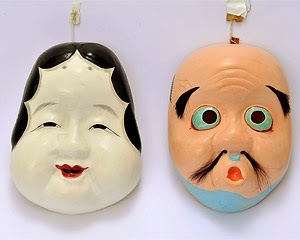 Yamagata Hariko are locally produced toys with humorous facial expressions, said to have originated in the works of a Buddhist sculptor who moved from Kyoto to Yamagata. 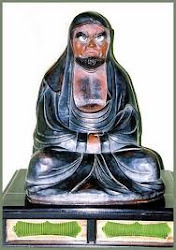 While on a pilgrimage to the Three Holy Mountains of Dewa of Yamagata, Shibue Choshiro 渋江長四郎, who was active in making Buddhist sculptures as well as dolls in Kyoto, found the Japanese paper-producing districts of Suzukawa and Sozuki in Yamagata, inspiring him to make Shibue Dolls. 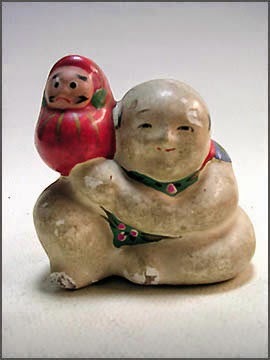 In 1901 Mr.Tokujiro Iwaki, who was one of Shibue Choshiro's first apprentices, continued this tradition with Yamagata Hariko (papier-mâché dolls). 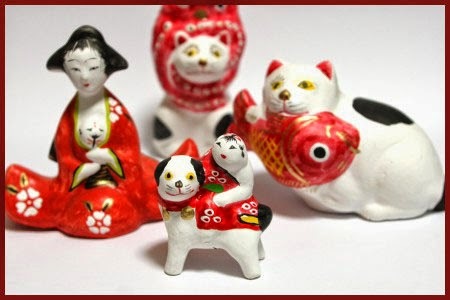 The Iwaki Family keeps almost 300 wooden molds, preserving the more than 100-year history of these dolls. 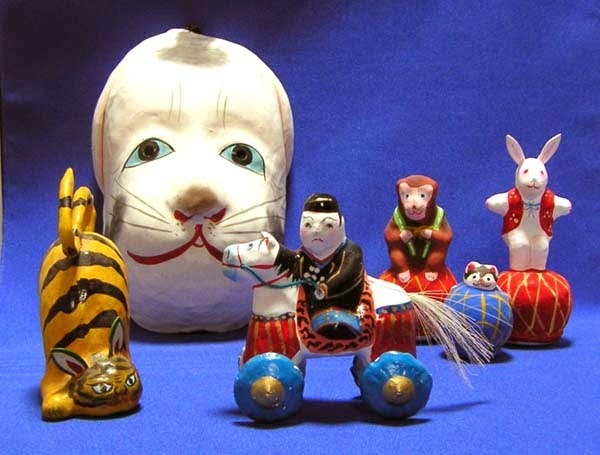 Yamagata Hariko consist of a variety of traditional charming objects including animal figurines and masks depicting plump women. These objects are made by placing moist high-quality Japanese paper into a wooden mold, then covering the paper with funori (a traditional Japanese starch made from seaweeds) many times and allowing the piece to dry in the sunshine. The formed Japanese paper is coated with gofun (made from pulverized seashells) and is finished by decorative painting. 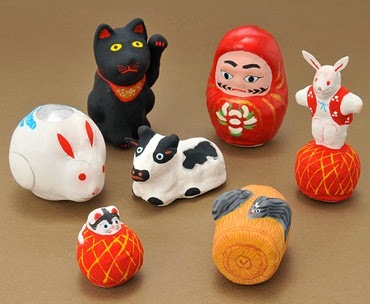 The tama-nori usagi 玉乗兎 design featuring a rabbit balancing on a ball, which was selected as a design for New Years Post Cards in 1999, is still very popular. 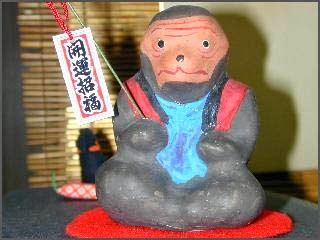 In 1870, Iwaki Tokujiro 岩城徳次郎 began to learn the craft from the Shibue family and opened his own store. Nowadays, Iwaki Hisataro 岩城久太郎 continues the craft. CLICK for more samples !
. 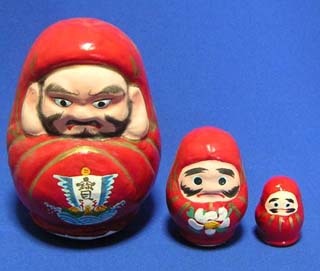 Sagara ningyoo 相良人形 Sagara dolls from Yonezawa . 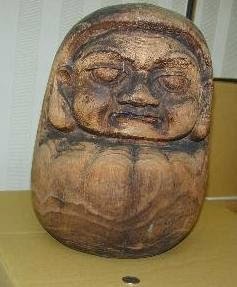 Made in Yonezawa 米沢 for more than 200 years. 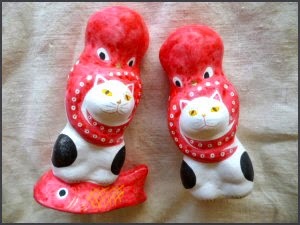 They are engimono for good luck. 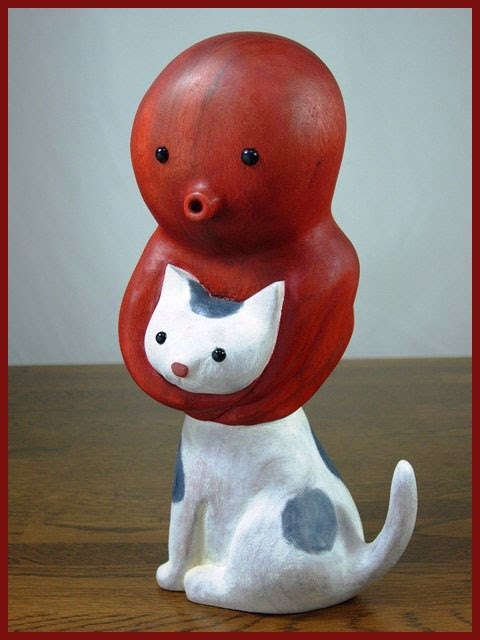 Made from papermachee, clay or other materials. 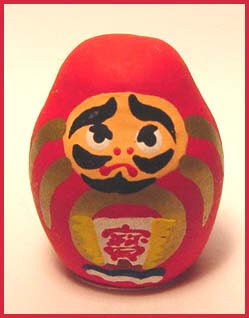 The motive is the common factor.
. Yamagata Folk Toys - this BLOG .
. . . ABC - Index of this BLOG . . .
. . . General Information . . .
. My Daruma Sensei . . . LINKS to my BLOGS . .
. . . TOP of this BLOG . . .
. . Wikipedia . .
. . . BACK TO . . .
. Japan after the BIG earthquake .